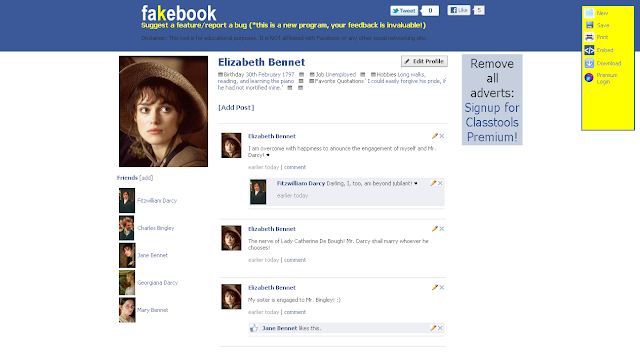 so, late last week i tweeted that my class was going to create fake facebook pages for characters from our novel, using the tool known as Fakebook. the premise is pretty simple: enter the name, create the bio with simple, straightforward "coding," populate a friends list, and add status updates and comments. you can add photos, links, and videos as well. this tool was created for history projects, but i thought it would suit characters as well, and sure enough, when we put the main character's name in and the name, a photo of him came up! pretty nifty. all but one of the students in this class have their own facebook page (yes, they are all 13), so they were familiar with the concept. back to the headaches: you can save your profile page, but only once you have created a bio, one friend, and one status update/post. sometimes this is not consistent. when you save, you put in your choice of password, and the site gives you a link. students did not have access to email to email themselves a link, so some of the quicker ones saved the link in a document (it was long). the ones who wrote it weren't all exact, which meant they had to start over the next day. 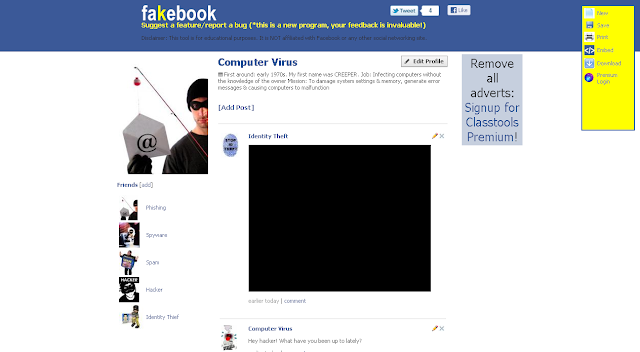 even saved profiles with proper links "did not exist" in some cases, and those students had to start over. if the kids hit "refresh" the entire profile got eaten. caveat: do not use forward, back, or refresh! this was a special problem for those whose profiles froze up. a couple other housekeeping things: i don't know about your students, but mine tend to use a smaller window (not maximized) when they work online, and they rarely considered scrolling, so they missed that when they were to save, they had to put in a password, which was hidden at the top of the screen. they encountered the same problem when they went back to their saved profiles - they needed to enter their passwords to edit, but had scrolled far enough down that the password window didn't show and they thought they were stuck. the lack of awareness of simple, basic computer use always tends to make me a bit grumpy. i'm looking forward to seeing their completed profiles, which i hope will properly document a time in our character's life. i also must reiterate: digital immigrants my behind! these kids can click and click and click on links, sure, but they *know* how to do very, very little without explicit instruction. final note: we had some other issues as well, which at first i thought were glitches with the fakebook programme. it turned out that the network connection is going down a minimum of 5x per hour. i have been documenting this with screenshots from my lappy during the last week. Thank you for sharing this. I am going to attempt to use this for a Uni assignment. where can i go to do this??? ?